Jamie Oliver was on TV showing how to easily poach an egg with cling foil. 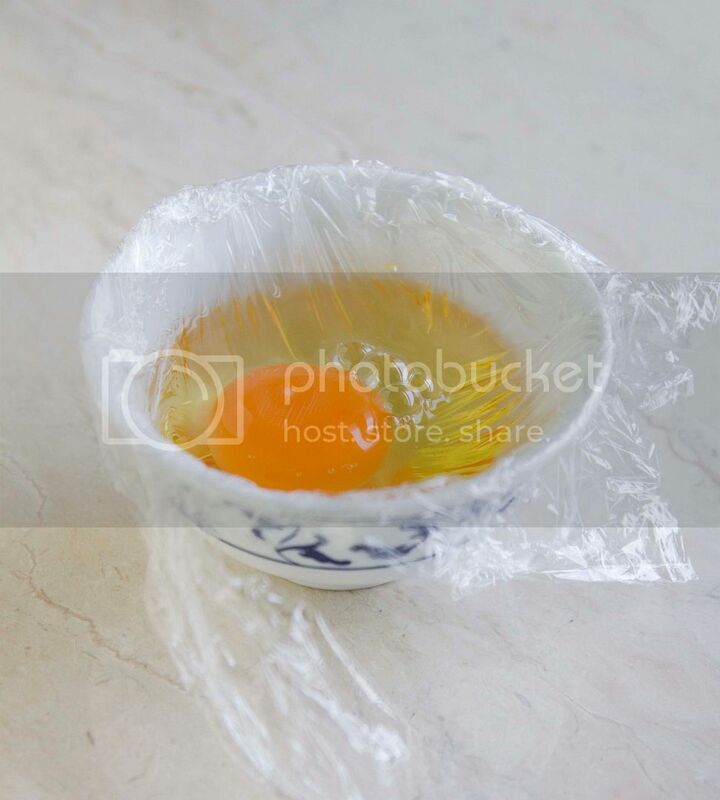 Basically he laid the cling foil over a cup, brushed with some oil to prevent sticking, cracked an egg inside the cup, then he tied a knot with the foil. On the side was a small pot filled with slightly simmering water. Chef Oliver dumped the cling foil egg into the water and just waited till the egg whites are cooked. Once done, carefully remove this little packet and cut off the knot, then a perfectly poached egg will come right off the cling foil. Everything looked so easy and hassle free. There were no vinegar and no stirring motion required while poaching the egg. The only thing was to watch closely to see when the egg whites are set. 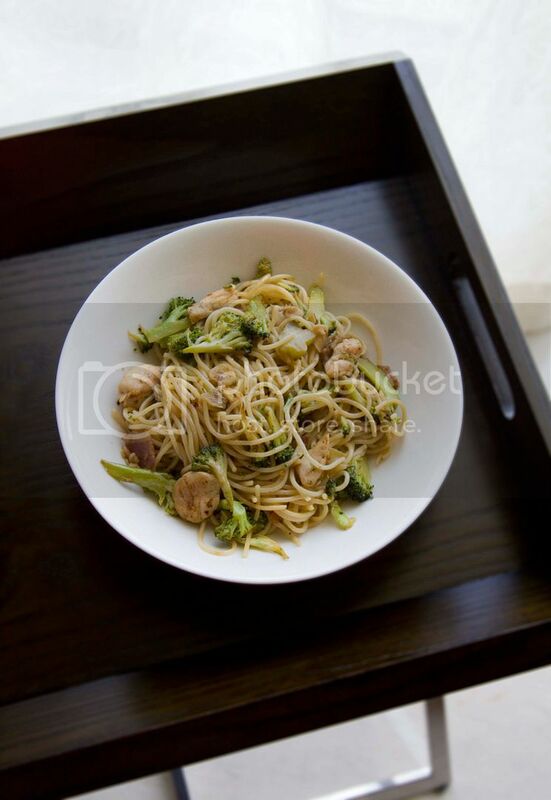 Curiously, I've decided to test out Chef Oliver's trick with my spicy spaghetti recipe. Bring a big pot of water to a boil and add a generous amount of salt, about 1 big spoonful. Add in the pasta and cook till al dente. Once done, drain well and set aside. In the meantime, chop the bacon slices and chicken tenders into bite sizes. Peel and slice the garlic cloves. For garlic lovers, just be brave and use 6 cloves, even 8 works as well. I know it sounds like a lot, but the cloves will only enhance the flavor without giving you a vampire repellent breadth. 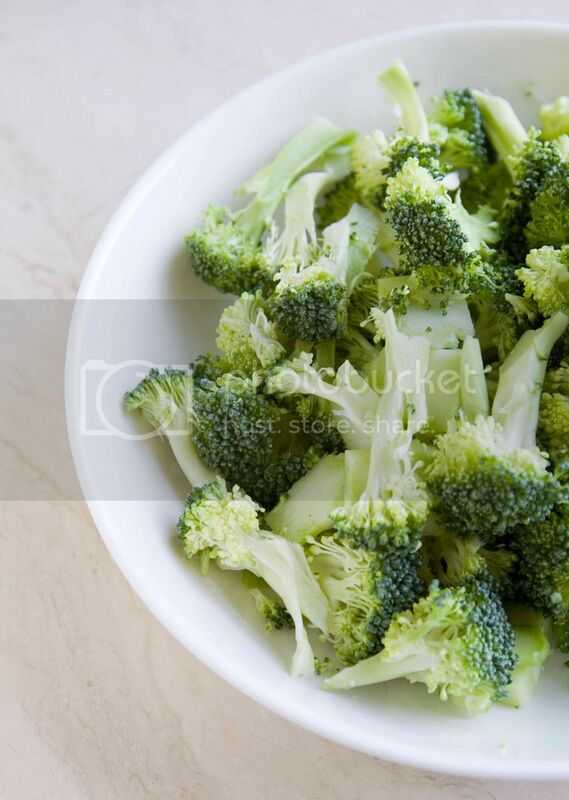 Thoroughly rinse and soak the broccoli. Shake off excess water and slice into thinner pieces. 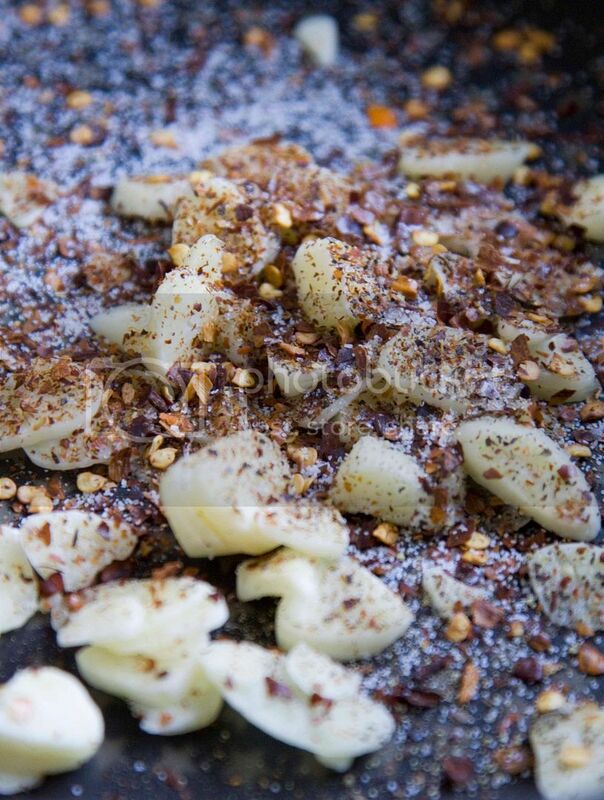 Drizzle one tablespoon of olive oil along with about 1 teaspoon of sea salt, 1 teaspoon of freshly ground pepper, and 3 teaspoons of red chili flakes to the pan. Add in chopped bacon and turn to medium high heat. Cook till some bacon fat has been rendered but not burning the garlic slices. 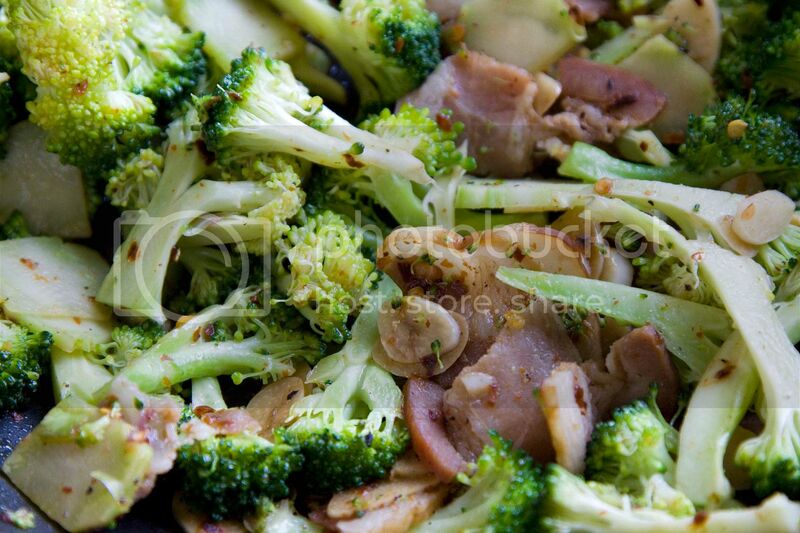 Toss in the broccoli along with small amount of salt. Give it a quick stir. Cook for about two minutes or till the edges of the broccoli florets are about to burn,but be careful not to burn the garlic slices. 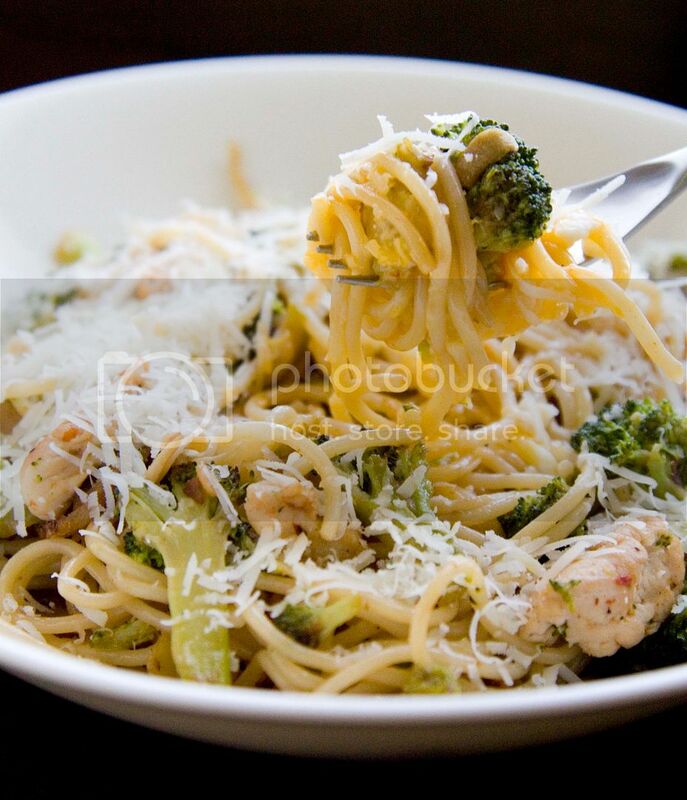 If the mixture appears too dry, add in one tablespoon of butter first, otherwise add the butter right before pouring the spaghetti to the pan. Add the chicken and cook for about one minute. Pour in dry white wine and and cook till the meat is about 90% doneness and the liquid has been reduced a bit. Taste and see if the mixture needs more salt. 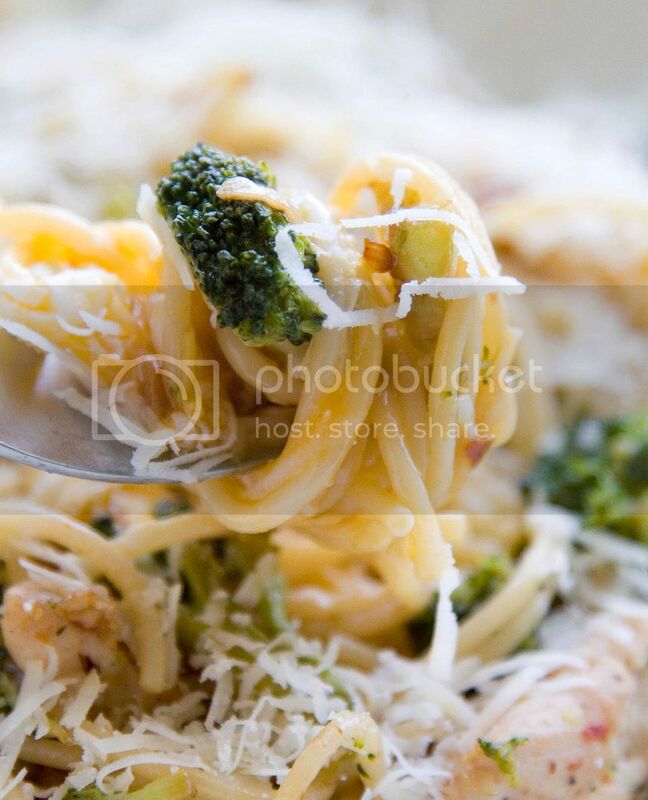 Transfer the pasta to the pan and mix well, cook for another minute so the pasta can better absorb the flavors. Here's Jamie Oliver's way of poaching the egg using cling foil. Bring a small pot of water to a boil and keep it slightly simmered. Lay the cling foil onto a small cup or a small bowl. Brush with some oil and crack an egg on it. Grab the edges of the cling foil and tie a knot so the egg will not spread all over. 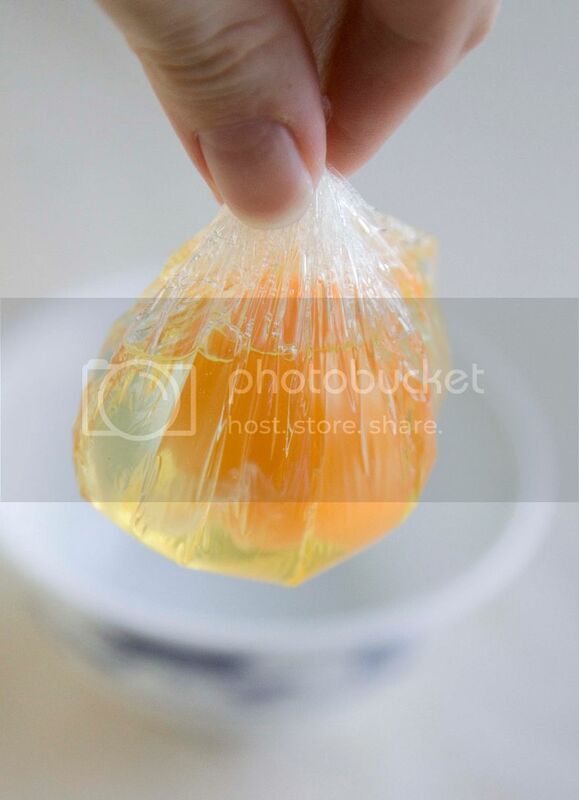 Transfer the egg packet to the hot water and cook till the whites are set. At least till it looks solid enough to hold up the runny egg yolk inside. Remove from water and cut off the knot. Carefully remove the foil and you'll get a nicely poached egg - supposedly. I have to admit that my first attempt was a bit overcooked. So I tested with the second egg and it was way too runny, which later made a mess in the kitchen...Oh well, it's all part of the fun! Chef Oliver might have mentioned something about how many minutes the egg has to be in the water. However, everyone is using different kitchen tools with various types of stoves. So the right timing can be a bit tricky, especially to such a delicate ingredient. Trial and error and reply on experiences will be your best bet. After all, we can always think of some delicious ways to finish off not so good looking poached egg accidents right? 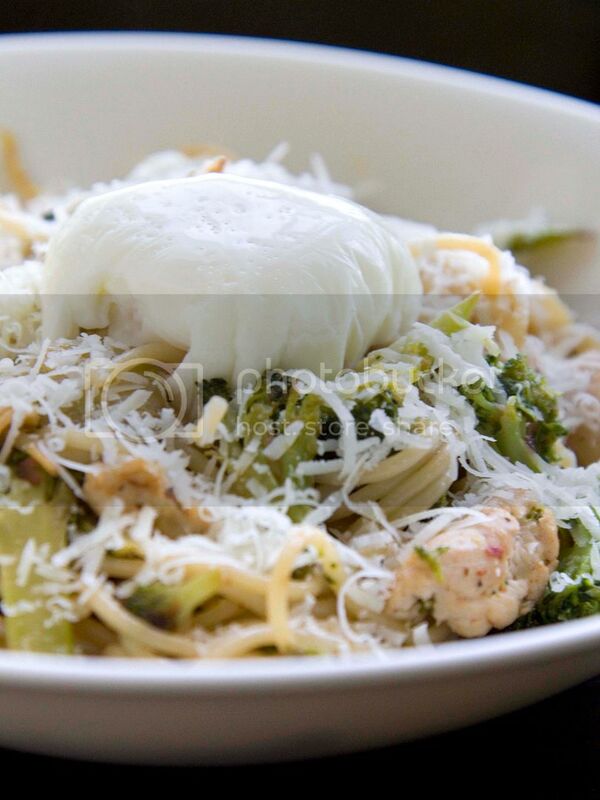 Top the spaghetti with generous amount of grated Pecorino Romano or Parmigiano Reggiano and serve with a poached egg. If you really can't get the egg consistency right, just add a fresh, uncooked egg yolk to the spaghetti and the remaining heat will still help bringing out the rich flavor of the yolk. Looks like another great trick to poach eggs. But it is kind of troublesome? No? I agree that trial and error is part of all our kitchen experiments. Who knows I might need to use the cling-foil method to poach eggs some day. Ha you're right! I know Japan sells some kind of gadget that you can make poached egg in a microwave! How crazy is that? I thought the egg was going to explode!